Whit Sunday falls on the seventh Sunday after Easter and celebrates God's gift of the Holy Spirit to Christ's followers. 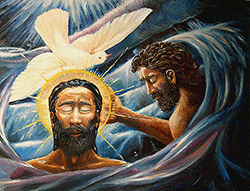 It is a traditional time for the baptism of converts, who wear white to symbolise new life, hence the name Whitsun or White Sunday. Whitsun Cake, as you will see from the recipe, takes two of our most seasonal June produce. Gooseberries (which need to be picked early for this cake) and elderflowers. 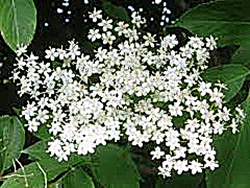 This makes a delicious dessert, cooked with or without the elderflowers, served warm with cream. Top and tail gooseberries into a mixing bowl. 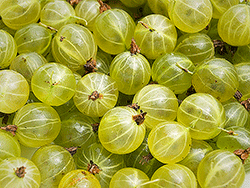 If using, carefully strip the elderflowers from the stalk and stir into the gooseberries. Sift the flour and baking powder into a separate bowl. Dice the butter and rub into the flour until the consistency of bread crumbs. Stir in the sugar and lightly beaten eggs. Stir in the gooseberry mixture. Line and grease an 8-inch cake tin (preferably a spring clip or loose bottom one). Turn cake mixture into it and mound it up in the middle. When cooked, cool for a few minutes before removing from the tin. Serve as a pudding with plenty of cream.